I often wonder how many gun owners donâ€™t have a .22 or at least a .17 caliber rifle. Sure, there are some that have only a pistol or shotgun for defense but I a betting that most shooters have one. They are fun, easy to shoot, perfect to learn on, highly accurate, affordable. If you add to one the very best rimfire rifle scope, it just gets better! Personally, I own nearly a dozen .22 and .17 caliber rifles having started shooting them when I was probably 5 years old. Some have scopes and some do not but I love shooting them, especially the .22 which is by far the most popular rimfire cartridge. The main reason I love them is the short range accuracy. Out to 50 yards, they can be tack drivers. To 100 yards, I can hit targets the size of a tennis ball even with a stock .22. Nearing the 200-yard point, I shoot a small coffee can. I even have a custom .22 that I can hit a nickel at 100 yards if the wind is good. There is simply nothing that beats a scoped .22 for sheer fun! But you have to get the right scope, not just for the rifle but for you. The main question you will have to answer is what you want your rifle to do. Do you want a rimfire rifle scope for target shooting or is it for hunting? What range and what size targets do you plan to shoot? How accurate is your particular rifle? Each of these considerations will help you pick the correct scope. One of the best capabilities of the .22 is its ability to hit very small targets. This leads some shooters, especially sandbag or benchrest shooters to pick scopes that have very high magnification, sometimes into the 40x range. This is what I use on my custom rifle, a 32x scope that has a big picture for tiny targets. It may seem overpowered but a dime sized target at 50 yards is a tough shot without a powerful scope. The opposite end is more the plinking type of target shooting. For this, I prefer a scope that has a little less power, usually less than 10x but no more than 15x. This allows me to shoot at closer range but get out to 200 yards on a target around the size of a softball. Many hunters opt for a scoped .22, this is especially popular in squirrel hunting and small varmints. The mentality of a hunter and the way they use a scope differs from a target shooter. You wonâ€™t find many successful hunters that use powerful rifle scopes because they lack the field of view to track your target as it moves. A scope like my 32x would be horrible for hunting. Instead, I would stick with something less than a 10x. Ethical shots with a .22 are probably around 50 yards and definitely not more than 100. The .22 just lacks the power. Letâ€™s face it, some .22s just arenâ€™t that accurate. A perfect example is the 10/22 by Ruger which is an amazing firearm but you arenâ€™t going to get tack driving accuracy out of one straight from the factory. This is the case with most automatic .22s that really benefit from shorter range shots and can get by with a less powerful optic. There is no reason to stick a 20x optic on a 10/22, it canâ€™t keep up with the scope and will never be perfectly zeroed. Many .22 bolt guns can be insanely accurate. For example, a scope for Ruger American rimfire rifles can be a little more powerful and still work well. These rifles are highly accurate though still not enough to warrant a scope in the 30x or higher. But any scope in the teens and low twenty magnification range will do well. If you want to step it up to those 30x and 40x scopes, you need a custom gun. There are some companies that make optics specifically marketed for rimfire rifles. As long as the company is reputable, these scopes are pretty good but avoid a budget 22 rimfire scope from any sketchy companies. Many of these specific scopes are more affordable than other scopes because they arenâ€™t made to stand up to more powerful recoil. This can save you a little money if your budget is tight. They may also have a BDC reticle more tuned to a .22 which can be a decent feature for novice scope shooters. Otherwise, they are no different than a standard rifle scope. Go with what works for your rifle without marketing getting in the way. I have a couple of rimfire specific scopes but most of the scopes on my .22 rifles are standard rifle scopes. I like to have the option of moving them to a more powerful rifle if I want and you canâ€™t do that with a purpose made scope but you get features more suited to the .22 with rimfire scopes. Your goal here is either to find a great rimfire scope for the money or the best rimfire scope that you can get. You can spend a lot of money on an optic and will usually get what you pay for but you donâ€™t want to get a scope that doesnâ€™t match well for your needs. Consider each of these points. 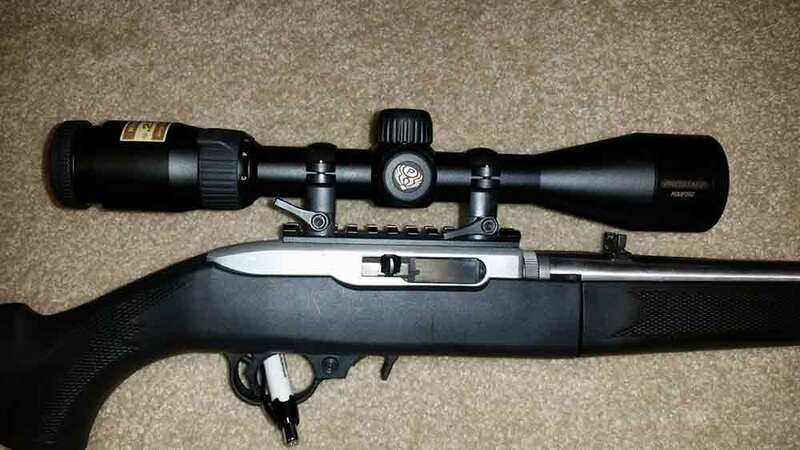 For scopes intended for hunting, I would look for something that maxes out between 7x and 10x. This gives you a good field of view while providing plenty of magnification for shooting even small game at modest ranges out to 50 yards or a little more. For plinking and target shooting for fun, I would go with something between 10x and 15x. This still gives you plenty of magnification to get out to long-range but doesnâ€™t get so powerful that you are restricted to long-range shots. This is the most versatile scope power allowing you to hunt or target shoot. For long range shooting, I would go with the same power spectrum of 10 to 15x. The bullet drop on a .22 is alarmingly large past 100 yards and high powered scopes make holdovers very hard. For a dedicated target gun that will shoot modest ranges at very small targets, you can safely go as high as you want. There are .22 BR scopes that have magnification in the 40+ range. This requires a very precise accurized or custom rifle. Otherwise, there is no advantage to having a scope this powerful. I will personally say that I am not a fan of a plain crosshair reticle for any purpose. If you are just starting out with a scope they are very easy to use but you will quickly outgrow them. The only exception may be the hunter that never shoots more than 50 yards but even then, I would prefer a different reticle. My favorite all-purpose reticle would be a duplex reticle that had markings I could use to gauge bullet drop. If it were tuned to the .22 that would be even better but few are. This allows you to judge bullet drop from anywhere around 30 yards out to over 100 without issue. Most of my high powered scopes have a full BDC reticle. These are complicated but can be used for any purpose once you get the hang of them. They can be a little confusing, especially if you are new to scopes but work very well. There are two types of adjustments you can get on a scope, these are often called capped or turret adjustments. Capped adjustments are intended to be a set it and forget it option where you use holdover and Kentucky Windage to put rounds on target. Turrets are made to adjust on the fly so your crosshairs are always on the target and you adjust your elevation and windage so the bullet always hits the crosshairs. For a .22, most people will never need turret adjustments. There is little downside to having them other than cost. For a hunting rifle or a scope under 10x, I wouldnâ€™t consider them a bonus at all. If you shoot small targets in competitions with a high powered scope or do some long range plinking, they can serve a purpose of making you more consistent and even handling extreme bullet drop. You just have to balance the usefulness with the cost. I will opt for a rugged piece of gear every time, even if it costs more. I like to know what I have will last and function well even if it takes a little abuse. That said, most .22s donâ€™t see much abuse and have very little recoil. You can get by with a scope that is a little less durable if need be. The same is mostly true for weatherproofing. I always opt for fog and water resistance in my gear and rarely compromise on that. But if you shoot indoors, under cover, or only in clear weather, there is no reason you should HAVE to have these features but you probably should anyway. What would happen if one of the greatest optics manufacturers took one of their best optics and fitted it out for the .22 caliber round? You would get the best budget rimfire rifle scope on the market, one that can do everything you would need to do with a .22 but with all of the durability and features of a high-end centerfire scope. The aircraft aluminum one-piece construction is incredibly tough, more so than you would need for a .22 but more is better when it comes to durability. The scope is nitrogen purged and 100% waterproof and fog proof. Even on a higher powered rifle, recoil shock wouldnâ€™t be an issue and you get all that from a scope that weighs right at a pound. The adjustments are a blend between capped and turret style with finger adjustments but can be covered to avoid any issues with loss of zero. The reticle is Vortexâ€™s V-Plex which combines the simplicity of a standard crosshair with a 1 MOA gap for calculating holdover. Everything about this rifle caters to the hunter by being simple and fast with plenty of accuracy for a sure hit. Of course, we have to mention the amazing glass in a Vortex scope. With their own multicoated lenses that absolutely shine when it comes to image quality and brightness, there are few better on the market and none at this price. No-glare and no-fog mean you can shoot anytime and anywhere in any weather, it may be overengineered for a .22 but thatâ€™s ok.
Not to ignore those who want to reach out a little farther, Bushnell makes an outstanding scope for .22 rimfire that also functions well for .17 and even .22 mag rounds. With all of the features you would ever need to put you on target far past 100 yards, this scope is the king when it comes to budget scopes with some real power. With a max 18x zoom and trueplex reticle designed for the .22 cartridge, even tiny targets are well within the abilities of this scope. Combine this with target turrets for .22 or .17 caliber cartridges and you can guide a hit onto targets well past the usual 150-yard mark, even out to 200 yards without much issue with 80moa of adjustment travel. Like all Bushnell scopes, the glass is plenty clear and bright with their own anti-glare and anti-fog coating. The side parallax focus works well to clear up image anywhere form 25 yards to well past any range you could reasonably shoot. Most scopes of this power that are designed for .22 have 1/8 MOA adjustments but the 1/4 MOA on the Bushnell seem to work just fine. Weather resistant and made from a 1 piece aluminum tube that is sealed against dust and rather resistant to any recoil this scope works quite well with lower powered rifles but keep it off anything more than a .22 mag. It just wonâ€™t hold up. This is a scope made for the range, not the woods. Back around to Nikon with their dedicated rimfire scopes. Their Prostaff series has been a best-selling optic for a number of years in all calibers and markets. They are simple, effective, and highly accurate time and again. This was one of my first optics and one that I keep coming back to for the price and quality. All ProStaff scopes have great glass that provides amazing light transmission and clear images. When matched with a huge 40mm objective lens and full multicoat, it just bets better. Add their own BDC reticle and you get a highly accurate and easy to shoot scope. The turrets are easily adjustable and very precise, being designed for the faster shooting .22 loads. They are capped turrets but adjust by hand rather than needing a tool for adjustment. This is the best of both worlds, especially for those who never know what they may be shooting at. All in all, this is a sturdy scope that is lightweight, waterproof, fog resistant and easily capable of lasting for a lifetime. Sight this scope in at the suggest 50 yards and the 3-9x will carry you through a variety of shooting situations and most reasonable ranges. Back again but this time to provide you the best damn rimfire scope under 100 bucks that you are ever likely to find. Though the 10x max power is lower, this is still as much as most shooters are ever likely to need. Great for hunting, plinking, and even some target shooting, this is a highly versatile scope that has a price that is nearly beyond belief. With all the quality you would expect from a Bushnell scope, great glass, and bright clear images, this scope is a high performer that is specifically designed to work with standard velocity .22 ammunition. The Dropzone 22 optic makes holdover calculations quick and easy for the hunter but accurate enough for long-range targets once you get the hang of it. Waterproof and fog proof with one-piece construction that is sealed and tough enough to last for years make this a scope you can dedicate to a rifle and even hand down to your kids when you are done. The multicoat provides some of the best low-light brightness you will ever get, even out of a reasonably small 36mm objective. Dollar for dollar this is a great scope for the money, no doubt about it. If you want to get the best on a tight budget, you likely will do no better. Bushnell has always done a great job on their .22 dedicated optics and this one is just another shining example. To kick things off, Nikon has always made amazing scopes, especially for rifles on the lighter side of the power spectrum. For the .22, it's really hard to beat the P-Rimfire if you are a hunter or plinker. The 2-7x magnification is just about perfect for everything you could ever need. With zero-reset turrets and a BDC reticle specifically designed for hypervelocity .22 rounds, this scope gets you on target quick with dead-on accuracy. The quality of the glass is quite good with Nikonâ€™s own multicoat technology. Images are bright, crisp, and clear with enough power to get out to 150 yards, the max range on the reticle. Weighing just under a pound, this aluminum and polymer scope doesnâ€™t add mass to your lightweight rifles but still holds up quite well. It is fog and waterproof with enough shock resistance to handle a few bangs here and there and more than enough for the .22s marginal recoil. With a good rifle and quality high-velocity ammo, this scope is capable of very tight groups and consistent impacts, one after another. For the hunter, you would likely never need more. This is a solid and durable scope that wonâ€™t break the bank, perhaps the best rimfire scope under 200 dollars in current production. One of the most common questions I get is what range to sight in a .22 at. There are a lot of theories about what works best and why you should use anything from .25 yards out to 1oo yards. I personally sight different rifles at different ranges depending on their use. If you have a scope with dedicated turrets or BDC reticle, its best to always follow the manufacturer's recommendation on range to ensure those features work correctly. Most of the time that will be 50 yards which is a solid range to sight in at for a variety of uses anyway. Hunting and plinking rifles I always sight in at 50 yards as well as any rifle that I intend to dedicate to shooting in 50-yard competitions. I would say that at least half my .22 rifles are sighted in at this range which is the shortest range I will ever sight in a .22. Scopes that are intended for shooting at a wide variety of ranges such as plinking or varmint rifles I sight in at 75 yards. You do need to remember what range your rifle is sighted in at in this case. I usually keep a small note taped inside my lens cover with the sight in range so I can manage shorter and longer range shots accurately. I do have a couple of rifles sighted in at 100 yards. These are rifles that I shoot nearly exclusively at that range. Bullet drop on a .22 is significant at that distance and shooting much of anything shorter is very difficult with a 100-yard sight in. These are also the rifles I use for the occasional 150 and 200-yard shots. It's important to remember that getting a .22 on target at long range or even with small targets is a joint effort. The best scope in the world wonâ€™t make you or your rifle shoot any better, it just makes you more consistent. In order not to be a consistently bad shot, you need to practice and get a rifle that is capable of handling the accuracy you expect. By choosing a scope with a power range and features that coincide with how you plan on using your rifle you can better manage your expectations of accuracy. Most people will do well with a scope 10x or less for most uses and be quite happy with it. If you plan to shoot farther or smaller, you will need to up that. This is a well researched article , BUT The vast majority of shooting with a rimfire is done at shorter rather than longer ranges the biggest handicap the bulk of rimfire specific optics is the parallax preset . I am a shooting coach in ncaa smallbore and air rifle disciplines , a highpower rifle coach and an “F”class shooter , I too started shooting as a child and the transition to optics was a bit rocky because the limit of the parallax, close shots had to have really low power scopes to remain in focus, for “real”precision as is possible with a good bolt gun or most air rifles a scope with parallax adjustment down to at least 25 yds (but 7 yds would be better) is essential . The rimfire world of scope manufacturing could well learn from the air rifle and benchrest shooting fraternity. I fully agree with what you say though I admit I am nowhere near your level of expertise on competition shooting with a .22. What we want to accomplish with this article is to encompass as many possible uses of the .22 as possible. Most .22 competitions I have shot are 50 yards and a few were just 25 yards. For that I fully agree with you about having a shorter parallax. However, for fun I do shoot a .22 out to 100 yards or more. We donâ€™t want to neglect those who do shoot at longer distances though they may not be as common. Perhaps we need to add some information about parallax and the importance of parallax adjustment. I think this would be an asset to some shooters. Thank you for your feedback, I will see what I can do to make some adjustments to the article to better inform our readers.